I picked this book up many years ago and raced through it too quickly as I am often prone to do with many meaningful things in life. I gave away my copy years ago but while perusing Ebay recently I found another one and immediately bought it. Joyce Cary was a very interesting man. He painted, and he became a writer after a long career in the Diplomatic Corps of the British Empire in Africa. He created the infamous character of Gulley Jimson in his very funny novel "The Horse's Mouth written in 1944. It was made into that marvelous film starring Alec Guinness who wrote the screenplay. 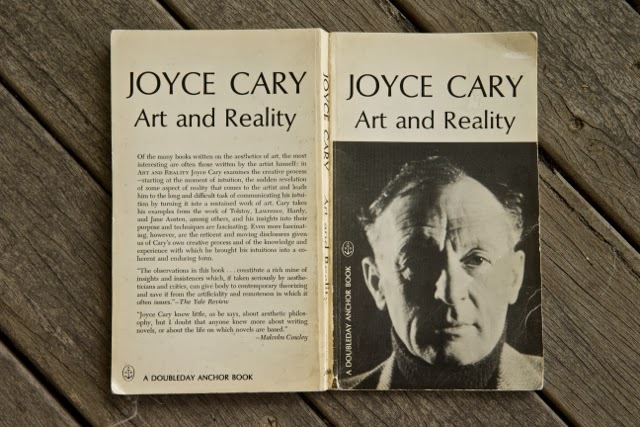 I have been going through this book again, and still find it full of intriguing insights as he explores the delicate subjects of art, education and cultural meaning. I don't always agree with him, but I find his ideas are sharp and full of conviction. I wonder how he might confront the Post-Modern aesthetic of today's Academic world for instance? He died in 1957 and this book of essays was published posthumously in 1958. The growth of every soul is mysterious and full of chances. It is the dream of every Utopian to throw luck out of the world - the luck of birth, of brains, of fate - to make all destinies equal. That is a dream that can't be realized. The world is inescapably shot through with luck, because it is also shot through with freedom. It is in the field given over to luck, the field of the unconditioned, that the free soul operates, and one man's art is another's luck, one teacher's prejudice is the making or the ruin of a poet. Luck remains and children will always have a different abilities, different kinds of home, different fates, in experience. But it is still the duty of government and parents to battle with luck, to try to give the equal chance. And the front of that battle is education. The education of the writer is necessarily the education offered to other children, and what I am arguing is that it can't be too good, too definite. You can't preserve his youthful intuition. The child poet and writer, in my own experience, loses his powers even more quickly than the child painter. For he starts his education in the arts of the word, he is getting ideas about life, while the other is still being allowed to amuse himself with a cloud box. No one, in short, escapes a conceptual and technical education in the use of words and ideas, and the only question is, how good should it be. I'm saying that it should be as good as possible. For the chance of destroying an original genius by too much scholarship, too rigid a conceptual drill, is much less than that of leaving him, when at least he is ready to do mature work, with a muddled mind and a feeble grasp of elementary technique. There is a lot of truth and sense in this argument. For most teaching, especially in the arts, has a good deal of bias. The fact that students catch their tastes as well as their ideas from their teachers, that the pupils of an art school copy the style of some dominant master, is a commonplace. And there is no doubt it is a pretty common cause why some of them never form an original idea or style. But can your teacher hides his bias? If he does, will he be any good as a teacher? Is not the good teacher precisely a man of strong convictions who can them over?